anyway (too many ideas, not enough finger nails! keeping within the lines of my first coat to achieve more opacity. Categories: How To, Inspiration, Manicures, Nail Art | Tags: NailArt, NYFW, simple | Permalink. 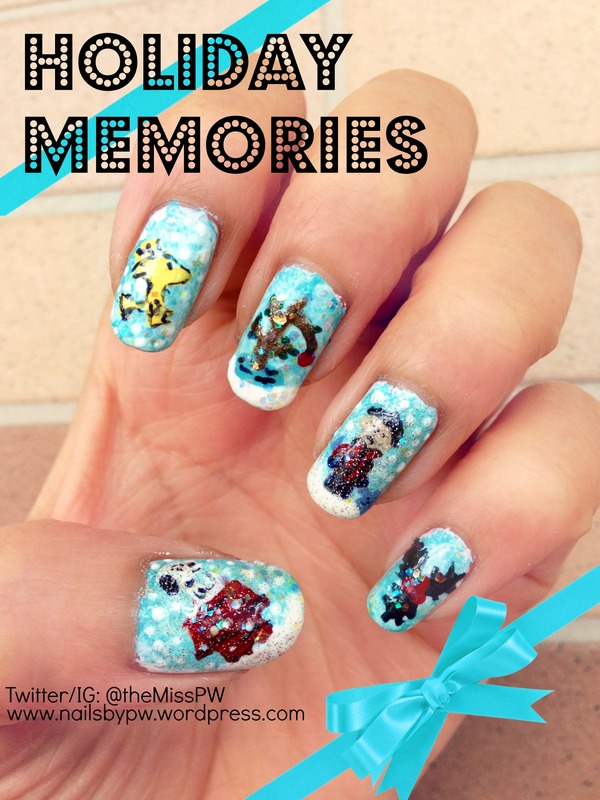 Holiday Memories – Vote for me!! 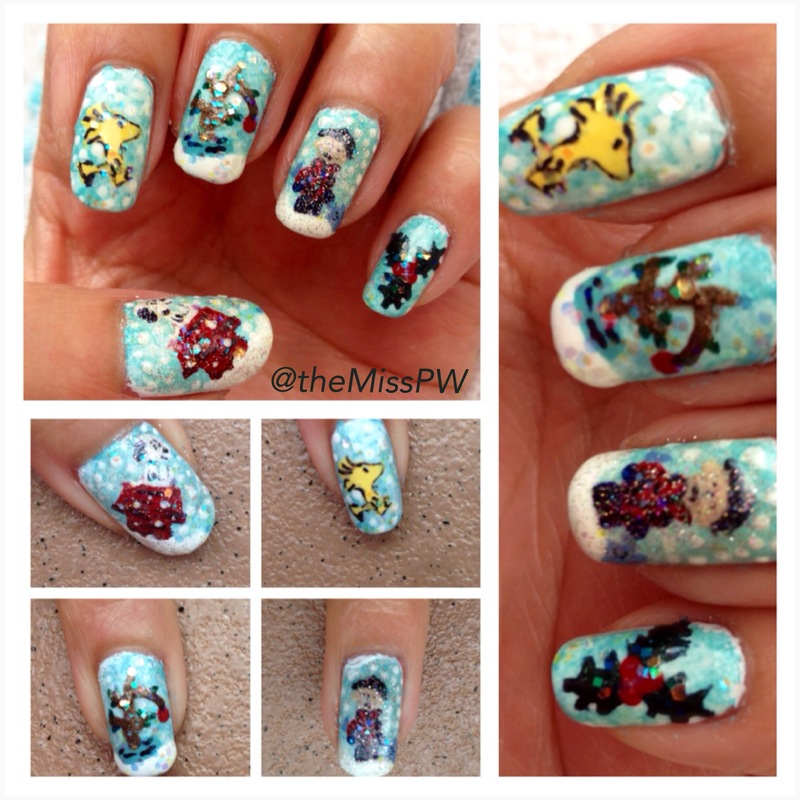 This is my final entry for the 2013 Holiday Nail Art Challenge hosted by Nail Polish Canada. 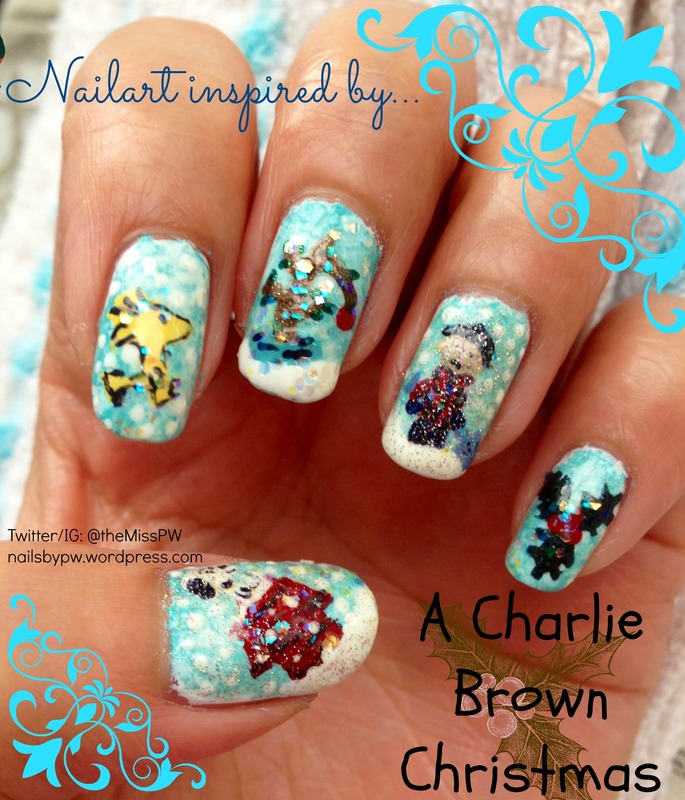 The nail art was inspired by the movie “A Charlie Brown Christmas” – a short movie that is played in Canada and the US pretty regularly around the holiday season, and is almost constantly referenced to as an all time favourite Christmas movie. I think that the idea of looking past the commercialization of our holidays and trying to discover or, for some re-discover the meaning of Christmas to them is a meaningful message to pass on. For some people, Christmas may hold significant religious meaning, while for others, it is purely a holiday off from work and the daily grind. It is best to be respectful of others beliefs and this is a great time to re-connect with old friends and say hello by sending a card. My holiday memories are always filled with happiness – I have fond memories of exchanging gifts with friends and family, getting excited about snow on Christmas Day and spending time with loved ones. Tell me about your holiday memories! I’d love to know what you hold special at this time of year. zhè ge zhǐ jiǎ yì shù shè jì shì yǐ cóng yī gè kě ‘ài de diàn yǐng! wǒ jì de cháng cháng huì dǎ kāi diàn shì ràng hòu kàn dào “A Charlie Brown Christmas” zài diàn shì bò fàng. zài měi guó hé jiā ná dà, zhè bù diàn yǐng zhī zhòng yào xìng shì fēi cháng shēn kè hé yǒu yì yì de, yīn wèi tā tí xǐng wǒ men shèng dàn jié bù zhǐ shì gòu mǎi hé jiē shòu lǐ wù. zhè bù diàn yǐng t íxǐng dà jiā yào xiǎng xiǎng shí’ èr yuè èr shí wǔ hào duì wǒmen de yì yì: wǒ men kě yǐ yǒu zōng jiào yì yì de shèng dàn jié, huò zhě zhǐ shì xiǎng shòu yǐ yǔ péng yǒu hé jiā rén gòng dù de shí jiān. nǐ kě néng yǐ jīng zhù yì dào wǒ zuò le zhè ge zhǐ jiǎ yì shù wèi Nail Polish Canada dì měi jiǎ shè jì bǐ sài. zhè shì zuì hòu yī gè xīng qí le! qǐng shàng wǎng wèi wǒ tóu piào…… qǐng xuǎn zhě dì 4 hào! 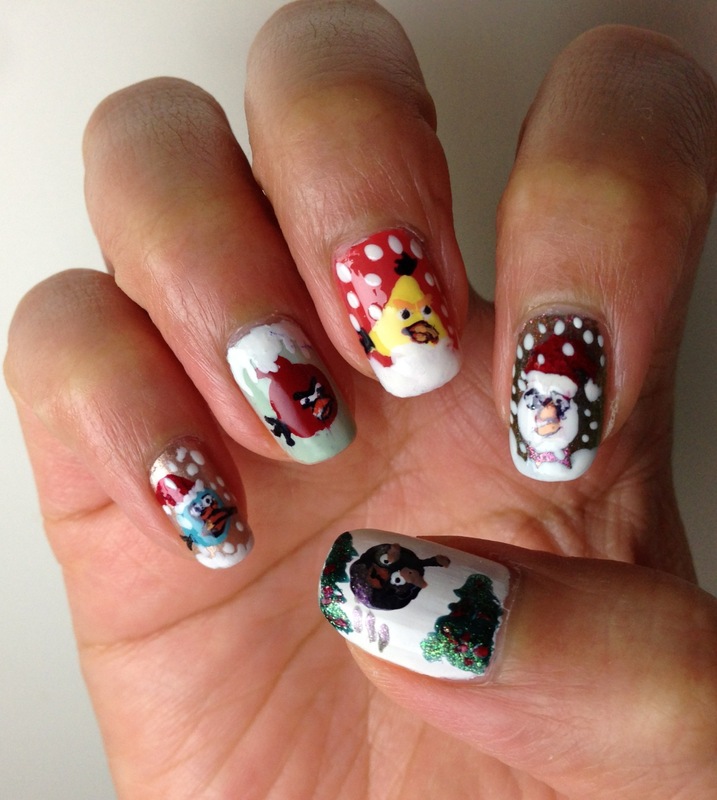 Categories: Manicures, Nail Art | Tags: Contest, giltter, Holiday Nail Art, NailArt | Permalink. 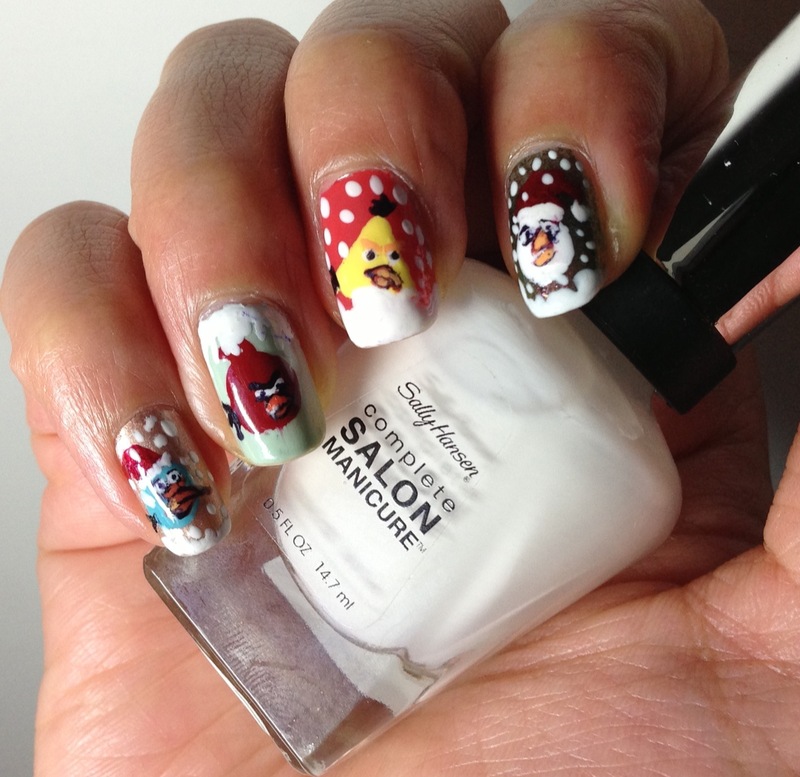 It has definitely been a while since I have written in this blog!I am back with a vengeance because I have caught the nailart bug – if you have been following my Instagram account you will notice A LOT of nail art (and the occasional dog photo interspersed in my pictures).Today, I wanted to share with you my Angry Birds + Christmas + Snow nail art design. This is the first official appearance of my “Cinderella Hand”!I am right handed, and my left hand desperately lacks the fine motor skills and dexterity for drawing on such a tiny canvas using nail polish. So, I used a toothpick to draw the birds onto a Ziplock bag. I let the designs dry overnight and then peeled each bird off the bag and placed it onto my nails. I can show you a tutorial if anyone is interested in seeing that process in action (or if you got confused by my explanation). I initially started out with just the birds on different coloured backgrounds, but because I attended a “friendsgiving” dinner and washed almost all of the dishes we used during the cooking/preparation process, my nails had some major tip wear. I decided to add some red santa hats and snow! zài zhè ge dì fāng nǐ kě yǐ kàn yī xià wǒ tiān tiān fā bù yī xiē shēng huó shàng de huó dòng! jīn tiān, wǒ xiǎng yǔ dà jiā fēn xiǎng wǒ zuì jìn de shè jì zhī yī… fèn nù niǎo + shèng dàn jié + xià xuě! wǒ guàn yòng shǒu shì wǒ de yòu shǒu, dàn shì wǒ ràng wǒ de fēi guàn yòng shǒu wéi bǎng yàng yīn wèi wǒ yòng yī gè jiǎn dān de fāng fǎ lái huà chū fèn nù niǎo de tú yàn. wǒ xià cì kě yǐ shì fàn gěi dà jiā kàn. wǒ yào cān jiā yī gè měi jiǎ tiǎo zhàn! rú guǒ nín xiǎng tóu piào gěi wǒ kè yī dào zhè ge wǎng zhàn bāng wǒ xuǎn piào. 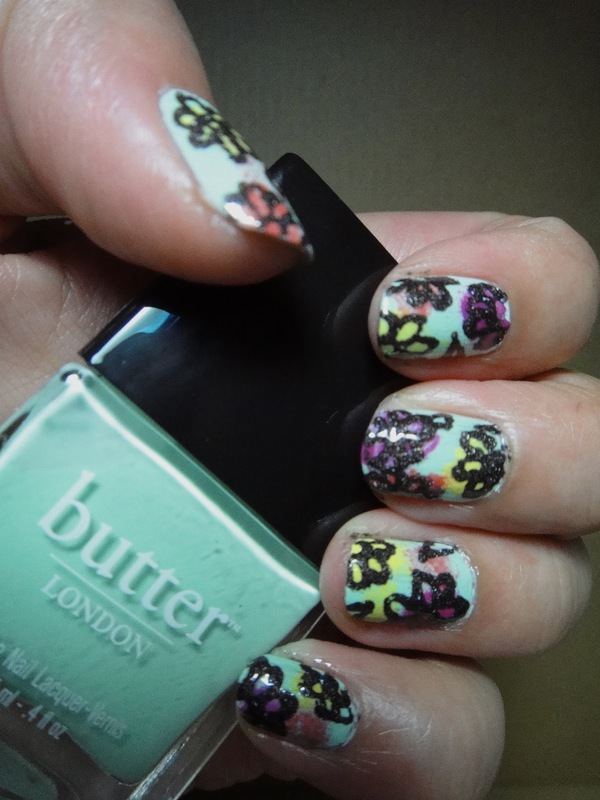 Categories: Manicures, Nail Art | Tags: Butter London, Contest, NailArt, OPI, Orly, Sally Hansen, Zoya | Permalink. These are the most beautiful designs I have come across recently! I think I’m going to give the roses a try and post the results this week. zhè shì wǒ zuì jìn kàn dào zuì měi de zhǐ jiǎ shè jì! wǒ xiǎng zì jǐ shì shì, ràng hòu bǎ jié guǒ fēn xiǎng gěi nǐ men kàn. 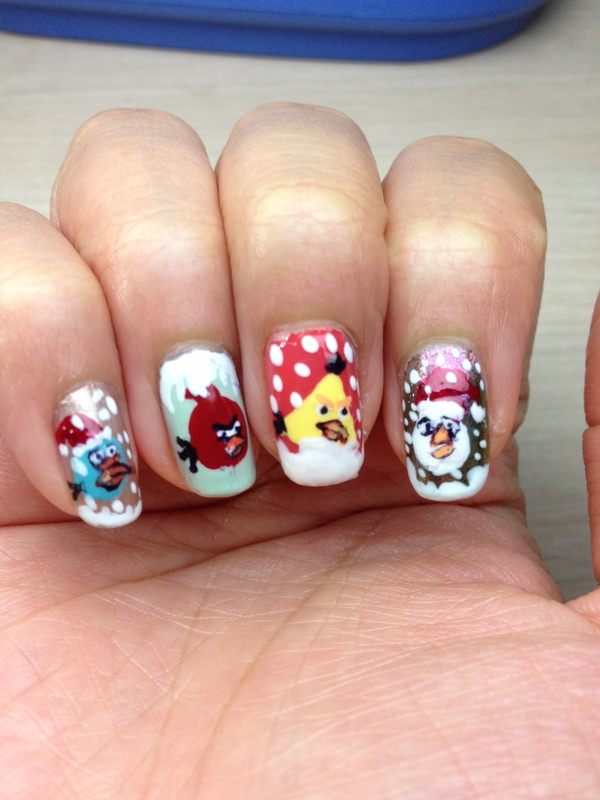 Categories: Inspiration | Tags: Must Try, NailArt | Permalink. 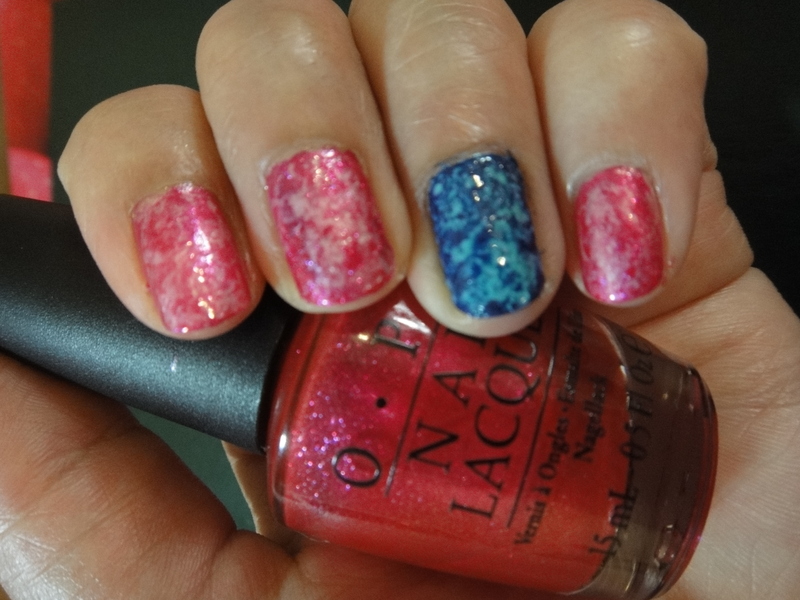 I was watching the video on YouTube (check out cutepolish’s YouTube Channel for fun designs!) and thought that I would give her #floraldoodle design a try.It was a little difficult to get the “doodles” to be as neat as hers and my sponging technique leaves a lot to be desired! 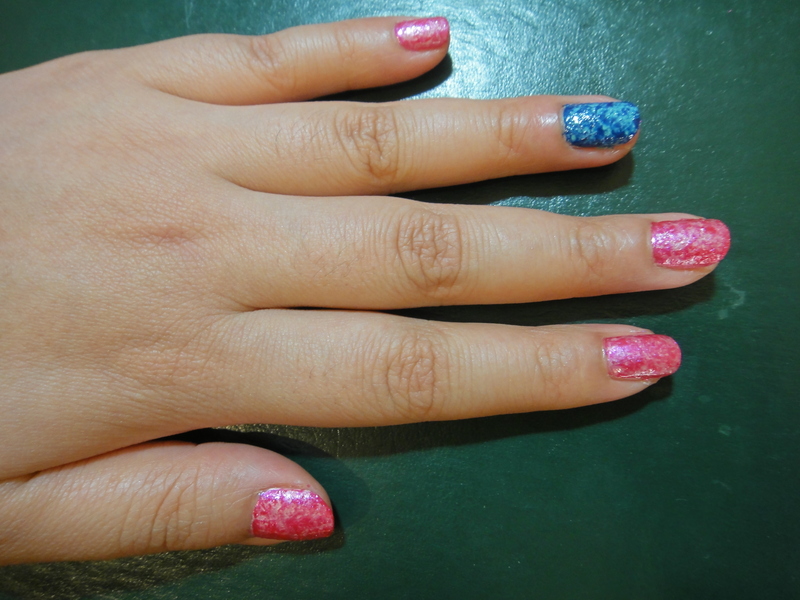 I guess practice makes perfect… do you attempt nail art designs you find online? Or do you leave that to the “professionals”?I used Butter London “Fiver” as the base colour, as well as “Primrose Hill Picnic”, “Cheeky Chops” and “Jaffa” as the sponging colours. 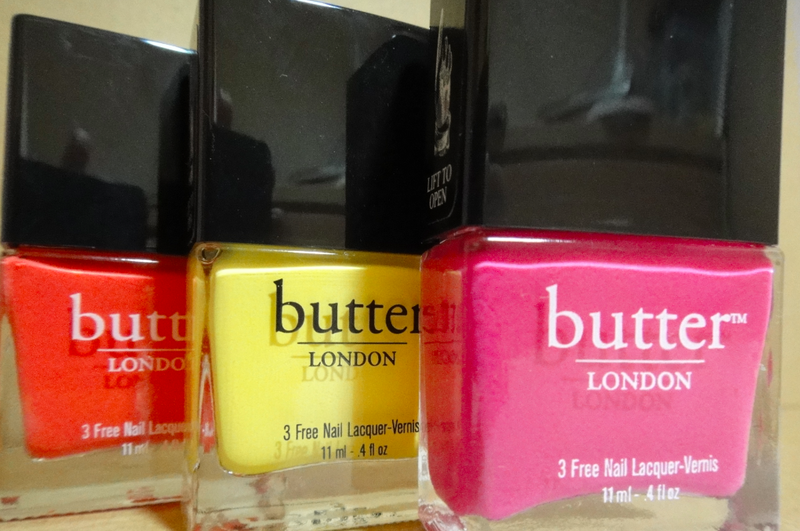 I really like the colour range offered by Butter London and the name/concept behind each of the polishes. 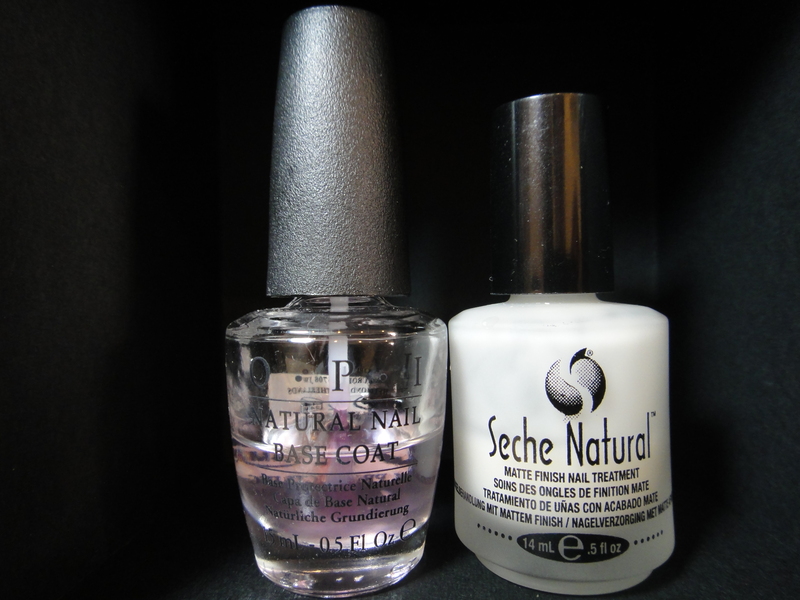 These polishes can get a bit expensive though… at $15.00USD a pop PLUS shipping and handling. I highly advise that you go to a store to see nail polish in person before you buy if at all possible… the cute names and swatches online may sway you to purchase a polish that you *thought* you wanted… but perhaps won’t impress you all that much once you open that long anticipated package. 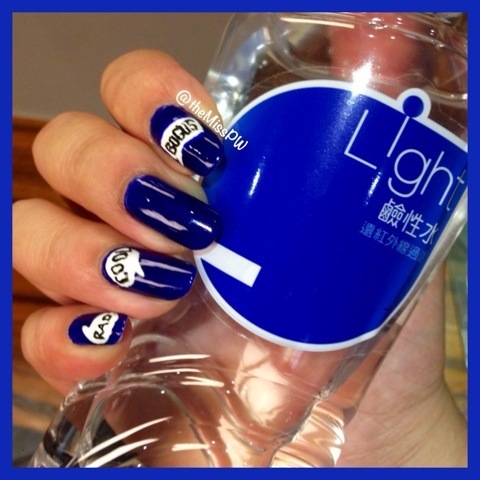 wǒ zài YouTube shàng kàn dào cutepolish de huā huā měi jiǎ shè jì. wǒ běn lái xiǎng huì hěn jiǎn dān, dàn shì chū lái de yàng zi yǒu diǎn bù yī yàng… xià yī cì, wǒ huì jìn liàng gèng zhěng qí de chá zhǐ jiǎ yóu de! wǒ yòng de zhǐ jiǎ yóu shì jiào “Butter” tā bǐ jiào tè bié de yuán yīn shì zhè pái zhǐ jiǎ yóu huì shǐ yòng yīng guó lì shǐ hé mù qián shì jiàn zuò wéi zhǐ jiǎ yóu de jí hé hé míng chēng. Categories: Manicures | Tags: Butter London, NailArt | Permalink. L-R: OPI Natural Nail Base Coat, Seche Natural Matte Finish Nail Treatment, OPI (NL S40) “Be A Dahlia Won’t You”, Wet n Wild Megalast (218A) “I Need A Refresh-Mint”, Zoya (ZP484) “Emme”, Wet n Wild Wild Shine (466) “Blue Moon” and Sephora Top Coat Ultra Brilliance. My nail polish collection started with OPI’s “Be A Dahlia Won’t You” and OPI currently makes up the majority of my polishes.The OPI brush is flat and wide, so it makes application pretty easy. I find that the flat brushes prevents polish from dripping down the plastic part, making OPI nail polishes easier to control.The Wet n Wild polishes were purchased on sale during a trip to California, with “I Need A Refresh-Mint” as a must-have that a lot of people talk about as a common favourite. Zoya “Emme” is the first (and only) nail polish I won from a giveaway! This polish has a metallic finish, so it shows some brush strokes after each coat. The great thing about Zoya is that they are a very health conscious beauty company. The Zoya nail polishes are for natural nails and they contain no formaldehyde, toluene, dibutyl phthalate (DBP) or camphor. I think a lot of nail polish companies in Europe and North America are much more aware of the harmful effects of chemicals that are added to nail polish and they are actively trying to remove these from their products. I hope that Asian companies will follow suit! 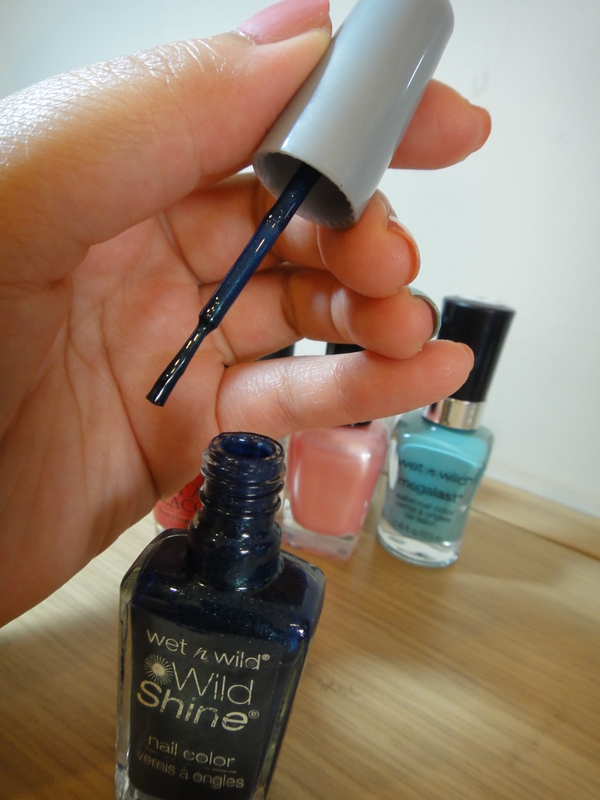 Wet n Wild Megalast hé Wild Shine shì měi guó pǐn pái lǐ miàn bǐ jiào pián yi de zhǐ jiǎ yóu. “I Need A Refresh-Mint” shì tā men zuì yǒu míng de bò hé lǜ sè. Zoya yě shì yī gè měi guó pǐn pái, zuì yǒu míng dì dì fāng shì tā men de”4-Free”zhǐ jiǎ yóu. wǒ jīn nián cái fā xiàn yǒu yī xiē hěn shāng shēn tǐ de huà xué yào pǐn zài zhǐ jiǎ yóu zhī nèi. Wǒ men cháng cháng chā zhǐ jiǎ de rén yào xiǎo xīn! yào hǎo hǎo yán jiū wǒ men mǎi de shāng pǐn. kàn kàn kě bù kě yǐ bì miǎn zhè xiē huì bǐ jiào jiàn kāng: jiǎ quán (formaldehyde), jiǎ běn (toluene), zhāng nǎo (camphor) huò lín běn èr jiǎ suān èr dīng zhǐ (DBP, yī zhǒng tiān jiā jì). wǒ de xí guàn shì yào shì yòng “dǐ jiǎ yóu”. wǒ mù qián shì zài 86.Shop de fù xīng fēn diàn mǎi OPI de Base Coat, Seche Natural shì zài jiā ná dà mǎi de. wǒ huì xiàn shàng OPI ràng hòu zài shàng yī céng Seche dāng yī gè bǎo hù zhǐ jiǎ de dòng zuò. I thought that I could try the Marbled Nail look that I saw in a tutorial from Birchbox using just 2 coordinating (or clashing… whatever floats your boat!) colours and some plastic cling wrap.First, you lay down your base colour. 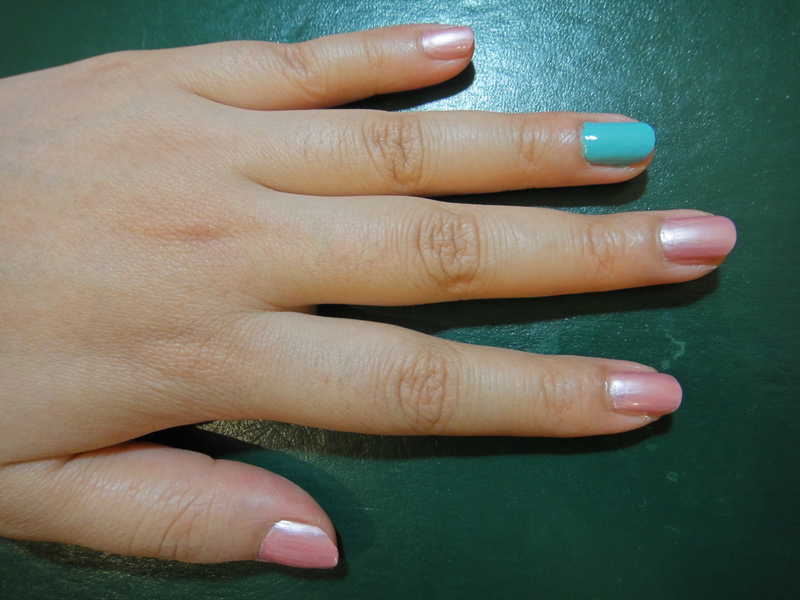 I chose Zoya’s “Emme” and Wet n Wild “I Need A Refresh-Mint.Then, going forward with just one nail at a time, paint the second colour (I have OPI “Be A Dahlia Won’t You” and WnW “Blue Moon”) on top of the (semi) dry base colour. Immediately, take some scrunched up plastic wrap and lightly dab your nail so you can remove some of the second colour to achieve the marbled look. I think you can wait for the base colour to dry completely before adding the second colour if you have loads of time on your hands. Then put on a top coat and you are good to go! zài yī gè wǎng zhàn wǒ kàn dào hěn yǒu qù de design: dà lǐ shí de zhǐ jiǎ! nǐ kě yǐ hěn róng yì shí xiàn zhè ge měi jiǎ yì shù shè jì ~zhǐ xū yào liǎng píng bù yī yàng yán sè de zhǐ jiǎ yóu hé bǎo xiān mó jiù kě yǐ le! Categories: How To, Manicures | Tags: NailArt, OPI, WnW, Zoya | Permalink.